As it’s getting warmer outside (just kidding – that never really happens in Scotland), I start to feel like I want to do bronzed looks all the time. So on my ‘beauty desk’ I keep switching between eye palettes and foundations etc, but all the bronzers and golden highlighters generally just stay out for frequent use. The Pure Color Love Liquid Lip glosses – two of them, and both in the Sparkle finish: 101 – Cookie Crystal and 500 – Limo Lights. I have to say I agree with Estée Lauder’s description of their Bronze Goddess Illuminating Powder Gelée this year: it really *is* the epitome of “endless summer”. And y’know, when there’s a yellow code for rain outside, you need to create your own summer and sunshine. The interesting thing about this is that it’s debatable whether this product is actually a shimmery bronzer or a highlighter – I guess it can be a bit of both. For fair skin tones (i.e., me), I think this product will mostly work as a ‘sunny’ blush topper, or a veil of light over your bronzer, or as eyeshadow. At least that’s my plan. The issue is – the base is dark enough for this this to not be suitable as a highlight for very light skin tones – yet, it is every bit as bright as a ‘standard’ highlighter. So based on that, you’d need to figure out how exactly you want to use it. Moving on to the Pure Color Love Liquid Lip glosses, these come in 3 finishes: Velvet Mousse (Matte), Sparkle (with individual shimmer particles visible) and Crème (glossy shine). 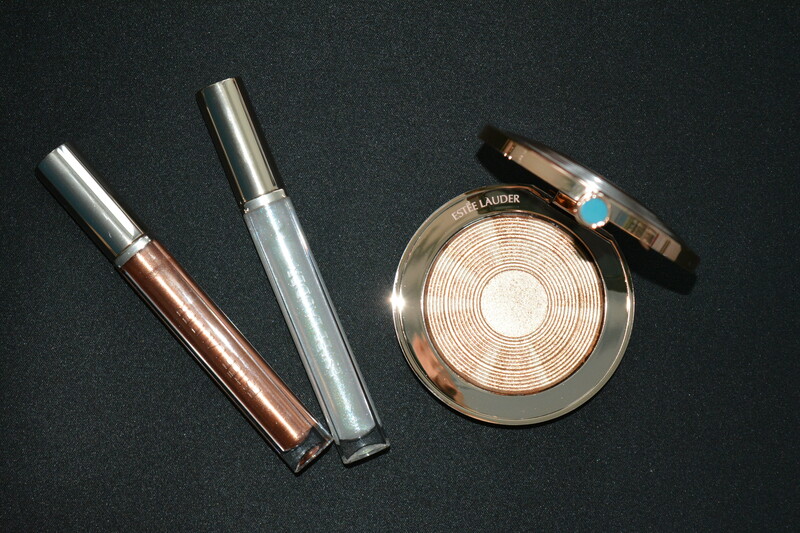 The two I got are both in the Sparkle finish: 101 – Cookie Crystal and 500 – Limo Lights. Both are super smooth and don’t feel gritty at all. They also feel nourishing on the lips, probably due to the formula containing pomegranate, mango and açai oils. Of the two, I prefer Cookie Crystal – a gorgeous, shimmery copper-caramel. If this doesn’t scream summer, I don’t know what does! Depending on how you want to use these, I can recommend either/both quality-wise. So… are you planning on picking up any of these? Limo Lights can be thought of as rain in the Scottish summertime. The colours are like a tiny rainbow! EL just blew me away with the Bronze Goddess! Gorgeous and it truly can be used for different purposes. I think I’ll be purchasing that!